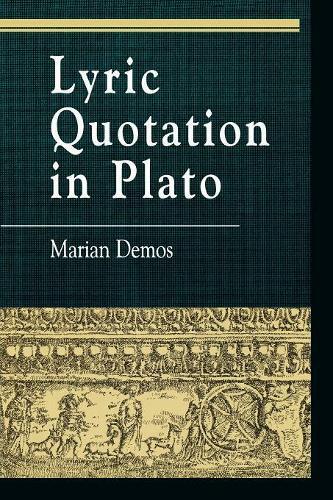 In this book, Marian Demos demonstrates the significance of three famous lyric quotations within their respective contexts in the dialogues of Plato. Demos reminds us that familiarity with the lyric poets was part of the educational background of Plato and his audience; therefore, she argues, Socrates is portrayed in the Platonic dialogues not only as a philosopher but also as someone with poetic sensibilities. Demos first investigates the Simonides poem in the Protagoras, showing that Plato has Socrates provide a fundamentally sound interpretation of the meaning of Simonides' words. She then argues that a purposeful misquotation of Pindar placed in the mouth of Callicles by Plato is not altogether implausible in light of the quotation's context in the Gorgias. Finally, Demos discusses Socrates' quotation of Stesichorus' palinode in the Phaedrus. Demos' analysis of the important role played by lyric quotation in Platonic dialogues will be of great interest to students and scholars of Plato and ancient lyric poetry.